﻿ Sonesta Hotel Tower & Casino Cairo Kaherah. JIMAT di Agoda.com! Sonesta Hotel terletak di kawasan kediaman di Bandar Nasr dan 10 minit pemanduan dari lapangan terbang. Hotel ini menawarkan 5 restoran dan 2 bar. Ia menampilkan kolam renang luaran dan teres matahari. Semua bilik berhawa dingin di Sonesta Hotel Tower & Casino Cairo adalah luas dan dihias secara elegan. Bilik-bilik ini dilengkapi dengan TV satelit dan bar mini. Semua bilik menikmati WiFi percuma. Bar tepi kolam renang dan spa perkhidmatan yang lengkap dengan hammam adalah syurga untuk istirahat. Selepas memanjakan diri, tetamu ditawarkan dengan pelbagai pilihan untuk menjamu selera di restoran-restoran gourmet di hotel ini. Perkhidmatan jemputan hotel menjemput tetamu dari Lapangan Terbang Kaherah dengan bas shuttle percuma. Perkhidmatan Luxury Fast Track disediakan dengan bayaran. Kereta dengan pemandu juga boleh disewa di kaunter tempahan lawatan di hotel ini. Pusat Persidangan Cairo berada kurang 2 km jauhnya. Kubu kota berada 15 minit memandu dari Sonesta Hotel Tower & Casino Cairo. Piramid-piramid berjarak 20 km jauhnya. 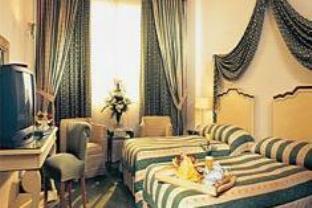 Sonesta Hotel is my usual accommodation in Cairo ,The warm welcome and the fast check in and out is always consistent. The front office staff always responsive to inquiries and questions ..I had slight problem with the shower and staff were prompt in attending the issue which was solved immediately. Hotel location is very good ,the proximity link road to the airport was convenient. The rooms were clean and we'll supplied with amenities . Highly recommended Hotel. Close to the airport and business center. They recommended a car with driver and a guide. The guide was a lady, poor service and only promote, bad experience. She only showed up less than half hour. But driver was excellent, he knew it and to be our guide himself. Good. The taxi driver at the lobby seems like a nice guy and we book a day tour with him, turns out that's a bad idea. we book a day tour with him from the hotel to Giza Pyramid. he mandatory us to stop and go to a few shops, expensive restaurant. and without knowing the standard price for the Gize ticket and horse/camel riding, we got ripoff pretty well. that was our 2nd day in Egypt, and we learn our lesson for the rest of the trip. Location, Coffee shop, and quietness. I am disappointed with my stay this time. During my previous visit, I have lost the internet connection in my Room and that wasn't fixed for 2 days. When I checked in this time I specifically insisted on having the internet in my room. First day was ok, second day lost the internet so they changed my room, less than 24h later I lost the connection again in the new room!!! During my complain, they said that there was nothing they could do as it is due to the internet provider, and I say I will not stay again at the Sonesta. For business travellers who need internet access, stay away from the Sonesta! very nicely situated and very easy to access tourist sites, etc. i was pleasantly surprised upon arrival to find i was upgraded to a queen room which was very spacious. my only negative comment is that you should avoid a room overlooking the pool area if you want to sleep at night - the live entertainment around the pool is loud and goes on until 2.00 am every night! clean, comfortable, helpful staff and good food. likely i will stay there again. That was my second stay at the Sonesta and was as good as my first! Driendly atmosphere and good service overall! Nice large and clean rooms. The hotel also offers good choice of food and entertainement. Near to the airport, shops in the hotel provides good basic needs such as souvenirs, etc. the staff of the hotel are quite friendly and communicating in english is still manageable. the room is nice but i disliked the cleanness of the bath tub and the shower. the shops located at the hotel are able to provide basic needs to travellers as i could get souvenirs, silver accessories, etc. overall, i'll recommend the hotel to travellers as the pros is more than the cons. Overall, I am satisfied with the stay. Enjoyed the casino at the hotel and the casino staff was really friendly and kind. The hotel staff could do much better and perhaps start listening to the guests more often instead. good location for tourist as the location of the hotel can skip the massive traffic problem of cairo downtown. very close to giza. staff are friendly. just be mindful of the casino as it will caused un-necessary expenses tough it could be fun! i came at 12:00 pm with a reservation for a room, the reception says we are overbooked and have no rooms available even though i had a reservation and told me to wait in the lobby for further news on a available room. after 4 hours waiting the manager finally tell me they have a small room. after checking in the room it was very small, disgusting room. i was surprised a hotel this big had something like this. the manager said he would change my room after a day or two, after 2 days the manager was unavailable and still no available room. i have been to this hotel before and had better service, but after this trip i will never go to his hotel again. This was my first experience at the Sonesta, and I truely enjoyed it. The room was nice, the staff were friendly and the breakfast buffet met my needs.